This G. Conway story is also in some ways a precursor for the big annual crossover events. 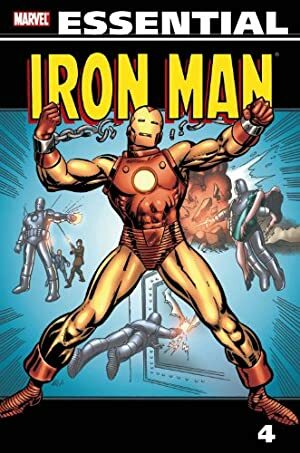 These became a staple of Marvel’s schedule in later decades. 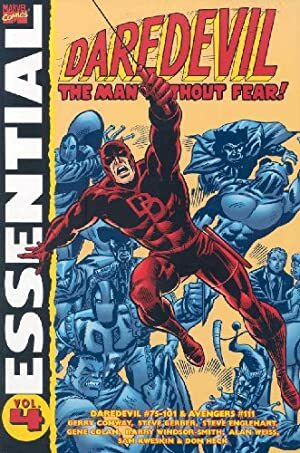 Though back then the Marvel books were siloed, Conway was writing a half-dozen of them and used that to pull off a rare move – a story that took place across multiple issues of both Daredevil and Iron Man. Group Affiliation: Agent of Baal. Height: 6’2” Weight: 300 lbs. The Assassin is an android with superhuman strength. His eyes can shoot energy beams. He’s pretty good at manipulating people, especially if one realises that he doesn’t grok human beings. 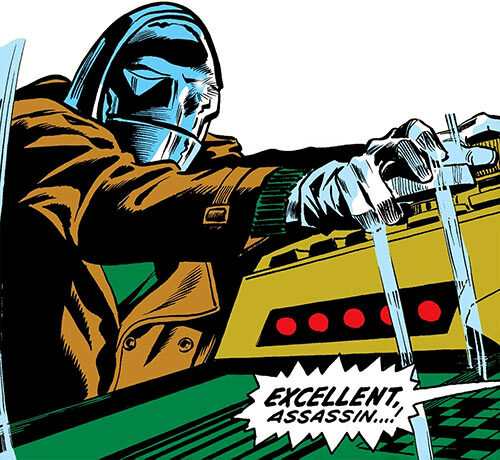 The Assassin is primarily a schemer and manipulator. In combat the Assassin tends to stay on a near-fanatical offensive. In DC Heroes RPG terms he will Press the Attack whenever he can. 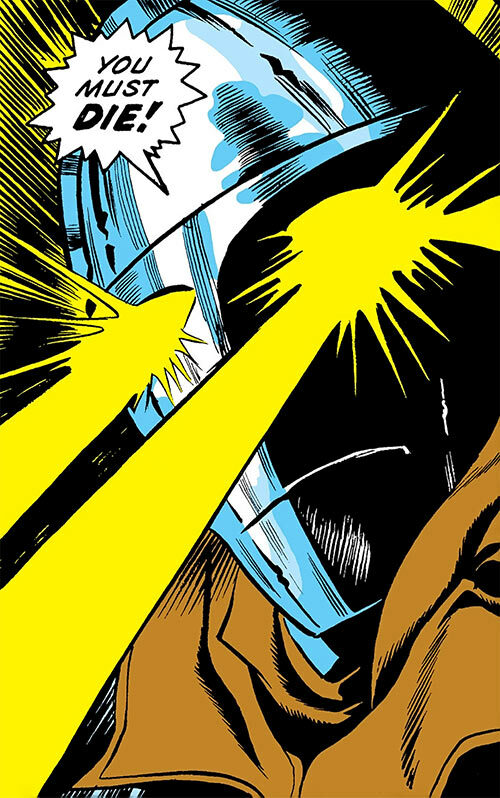 He favours his eyebeams over close combat, even though they seem less accurate. Kline has the skills and resources to build advanced androids. These will usually believe themselves to be human, which is likely why they seem psychotic. Or perhaps all templates for human personalities available in the era of Baal had psychiatric and faith issues, including Mister Kline. Alternatively, it is possible that all three were originally human beings who were rebuilt as robots or full conversion cyborgs so they could serve as agents. If so, they are unaware of this. Circa the 120th century, the computer Baal was created to govern Earth. However, after two millennia, Baal was alone. Humanity had either perished or abandoned its homeworld. Hoping to alter history to prevent this, Baal sent android MK-9 back over 12,000 years. MK-9 was to set in motion events whose repercussions would affect Earth in a hundred centuries. As “Mister Kline,” MK-9 worked with XXth century scientists to mutate superhuman operatives. These included “Bull” Taurens, a ruffian whom Daredevil (Matt Murdock) had prevented from abducting test subjects. Mutated into Man-Bull, Taurens attacked Daredevil. But Kline was more interested in Daredevil’s friend, D.A. Foggy Nelson. He blackmailed Nelson over a past impropriety, to undermine his gubernatorial aspirations. Meanwhile, two Kline operatives, the clawed Slasher and the telepathic Demitrius, sabotaged buildings. These had been designed by industrialists Tony Stark and Ben Crandal, who were to be discredited. However, they were defeated by Iron Man. When Stark testified in Washington, D.C., the two attacked the Capitol but Iron Man again prevailed. Nevertheless, Senator Ernest McJavit (actually a Kline-created android replacement) used the fiasco to discredit Stark and Grandal. Back in New York, where he had carefully cultivated a reputation as a criminal mastermind, Kline entrusted Daredevil’s abduction to the Owl. But the Owl tried to kill his foe instead. Kline then arranged for Daredevil’s rescue by the Black Widow, whom Kline hoped would romance Daredevil as part of his plans. 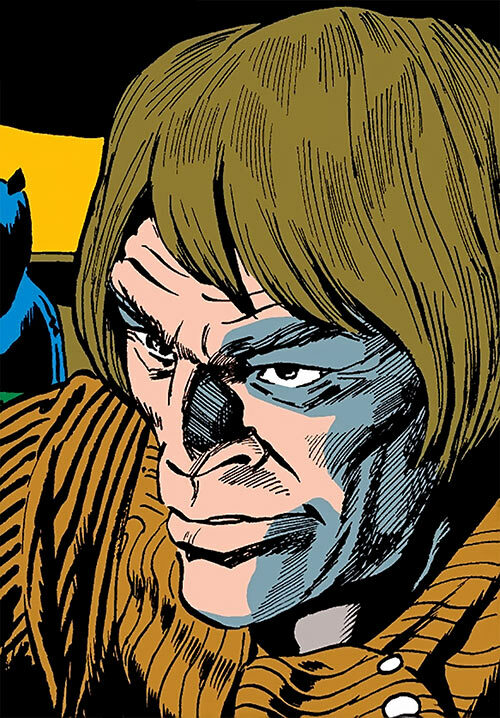 Returning his attention to Iron Man, he assigned the enigmatic Mikas of his “Mutant Sector” to abduct Stark’s girlfriend Marianne Rodgers. This lured Iron Man into a trap. Kline hoped to make Iron Man his anti-military pawn. However Mikas, maddened by his own power, tried instead to kill the hero. Stark released his armour’s full energy to destroy Mikas’ base. Kline fared better with an android Scorpion duplicate. It lured Daredevil and the Widow into battle, then fell to his “death,” implicating the Widow for murder. 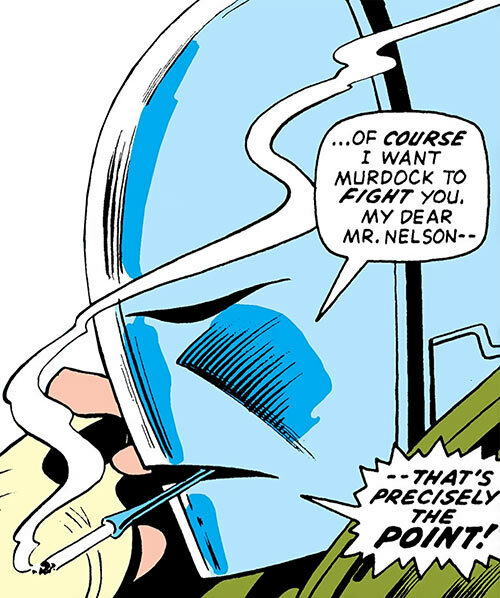 While Nelson, directed by Kline, prosecuted the Widow and Matt Murdock defended her, Kline sent a Night Phantom android to threaten Iron Man and Rodgers. He then sent a Mister Hyde android to destroy the Scorpion android’s “corpse”. With the “victim’s” body destroyed, the charges against the Widow were dropped, again at Kline’s orders, damaging Nelson’s career. As anticipated, feelings developed between Murdock and the Widow. Thus, whilst the Widow vacationed in Switzerland, Kline approached her as scientist Emil Borgdsky. He told her about a cure for blindness. Murdock thus came to Switzerland. Apparently, Mister Kline knew that recovering his sight would end Daredevil’s career. This apparently would have significant effects on the timeline , advancing Baal’s plans. But Daredevil discovered MK-9’s base while the android was busy conferring with Baal over time radio. Kline revealed his android nature and attacked, but received a head injury. As Kline struggled to repair himself, the empathic Final Sons of Man came in from the 170th century. These were two metallic, armored or robotic “new people”. Their goal was to ensure that Baal’s future would lead to their own, by destroying Kline and his base. They then teleported Daredevil and the Widow to safety and departed. Although Kline is no more, the full extent of his operations was never determined. Thus the ultimate effects of his activities upon the future cannot be predicted. Note that Mister Kline is a chain smoker, unlike most androids I know. 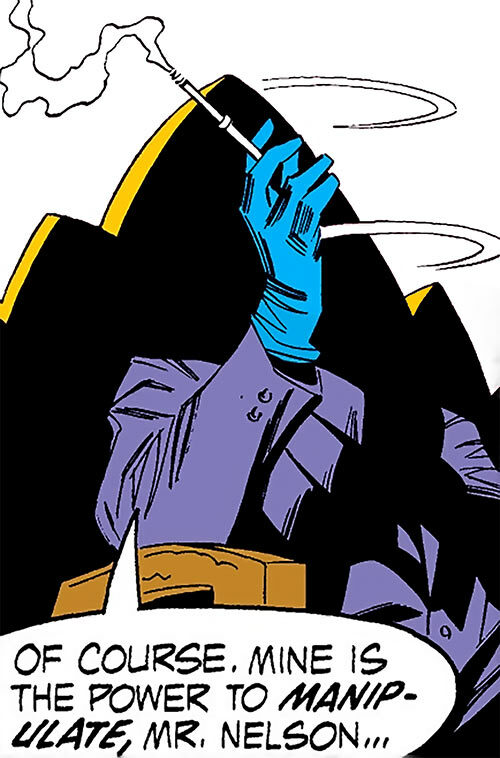 He uses a short cigarette holder. A scheming organised crime type, making threats and alliances as he moves his pawns. An android who knows relatively little about human nature. He eventually decided to build robots rather than use human criminals such as the Owl. That was due to the unreliable and unpredictable nature of humans. Kline seems to have a near-religious reverence toward Baal. When Baal was pleased with his successes and told Kline he was no longer a mere android but could wear the title of the Assassin, Kline did so with enormous pride. The obscure Professor Menace, a early 1960s Wonder Woman and JLA foe, could be used as the base for a DCU version of the Assassin. 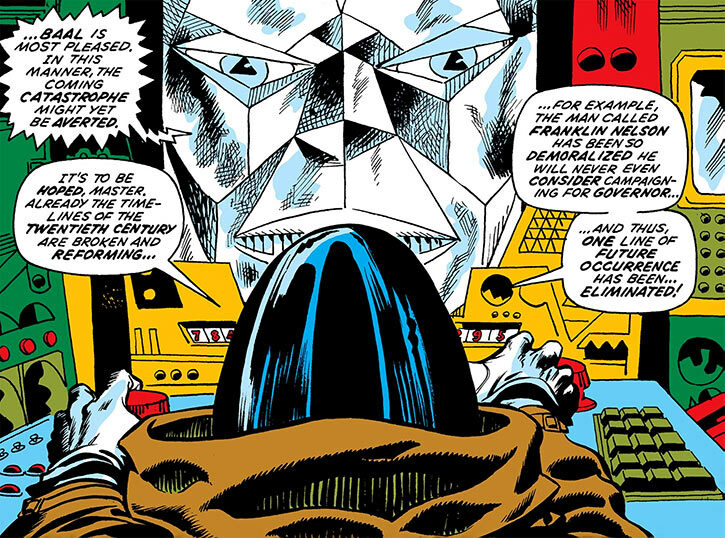 He already has robot duplicates of contemporary villains that could be used. For instance Mikas the Soulfather could be an evolution on his Doctor Destiny android duplicate, based on whom Doctor Destiny will become decades later. 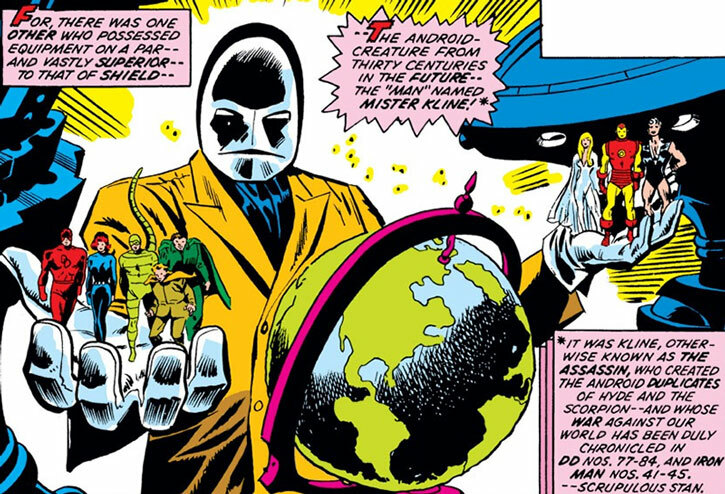 His 1960s forays against the Amazing Amazon and her friends as “Professor Menace” could have been but a stepping stone toward a more complex plan during the 1970s as Mister Kline, based on the Marvel story and targetting… Wonder Woman and Aquaman, or something along those lines. Heat vision can also be used to invisibly heat metal objects, making them too hot to hold. This is simply a Disarm Manoeuvre. Expansive HQ, Genius, Scholar (androids). Underworld (Low), His own robots (High), Baal (Low). Distinct Appearance (though he can disguise himself), MPI. Mister Kline developed experimental remote mind control technology. This research did not quite work, but could send visions and images to the brain of people many miles distant. Those visions were too obviously unreal to have any APs in Illusion, but could be used to make people doubt their sanity and as psychological warfare. – Immunity 30 (Fortitude effects). – Mind scanner — Mind Reading 6 (Ranged, Limited to Surface Thoughts). – Eyebeams — Ranged head Damage 8. – Expert about androids — Enhanced Intellect 4 (Limited 2 to rolls pertaining to androids and gynoids , including Technology rolls). Benefit 3 (Millionaire), Benefit 2 (Knowledge of future history and tech). Fanatical MK-9 is utterly devoted to serving Baal. Very stable genius Mister Kline sometimes evidences borderline or psychotic behaviour. Trade-off areas. Attack/Effect PL 9, Dodge/Toughness PL 9, Parry/Toughness PL 9, Fort/Will PL 4. Points total 148. Abilities 60, Defences 15, Skills 14, Powers 51, Devices 2, Advantages 6. Equiv. PL 10. Source of Character: Old Marvel comics. Helper(s): Darci. It’s an unclear time travel story, so the chronology and storyline are hard to pin down. 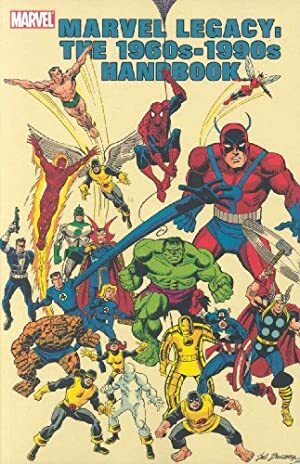 I’ve thus used the official ones appearing in the Marvel Legacy 1970s Handbook.